You should, because we live in an era of deception and duplicity where the most trusted and valued sources of information are hijacked by much bigger interests than you can imagine. The Internet is one of the last frontiers for truth, informing and educating billions on why our systems of health, agriculture, medicine and many other areas we depend on are failing us. The reason they're failing us is because corrupt governments, corporations and the media are constantly feeding us lies on a daily basis, which through repetition, the public eventually accepts as truth. Supporters of this technology maintain that it ensures and sustains food security around the world as the population increases. As well as scientific debates on the merits of genetically engineered food, there are equally, if not more important, debates on the socioeconomic ramifications of the way such science is marketed and used. When genetic engineers insert a new gene into any organism there are "position effects" which can lead to unpredictable changes in the pattern of gene expression and genetic function. The protein product of the inserted gene may carry out unexpected reactions and produce potentially toxic products. There is also serious concern about the dangers of using genetically engineered viruses as delivery vehicles (vectors) in the generation of transgenic plants and animals. This could destabilize the genome, and also possibly create new viruses, and thus dangerous new diseases. Sensitivity to electromagnetic radiation is a very big health problem of our youngest generations. The media and medical community dismiss it, but it is imperative health practitioners, governments, schools and our entire society learn more about the risks because the human health stakes are significant. The effect of EMFs on biological tissue remains controversial. Virtually all scientists agree that more research is necessary to determine safe or dangerous levels. It's like one big human experiment which we won't know the results of for several decades. Now, with the increasing proliferation of wireless handheld and portable devices, it is literally impossible to escape EMFs in any major city. What they do know is that iron, which is necessary for healthy blood and is stored in the brain, is highly affected by EMFs. The permeability of the cell membranes of nerves, blood vessels, skin and other organs is also affected, as well as the intricate DNA of the chromosomes. Every bodily biochemical process involves precisely choreographed movement of EMF sensitive atoms, molecules, and ions. Not only do EMFs impact your own health and that of your children and pets, but also the Earth as a whole, as our overuse of electricity contributes greatly to pollution from coal-fired electricity plants. Those who are wise will heed the warnings of the electrically sensitive and reduce the EMF radiation in their homes through good design and reduction of dependence on electric appliances. Doctors are often criticized for prescribing unneeded tests and procedures that harm more than they help and add to medical costs that could otherwise be avoided. 12 medical tests and procedures now being questioned worldwide as unnecessary and potentially cause - sometimes harmful results to patients. There is a secular trend between breast cancer mortality and screening programs specifically medial diagnostic techniques such as mammography. In a Swedish study of 60,000 women, 70 percent of the mammographically detected tumors weren't tumors at all. These "false positives" aren't just financial and emotional strains, they may also lead to many unnecessary and invasive biopsies. In fact, 70 to 80 percent of all positive mammograms do not, upon biopsy, show any presence of cancer. A prostate (PSA) blood test looks for prostate-specific antigen, a protein produced by the prostate gland. High levels are supposedly associated with prostate cancer. The problem is that the association isn't always correct, and when it is, the prostate cancer isn't necessarily deadly. Only about 3 percent of all men die from prostate cancer. The PSA test usually leads to overdiagnosis - biopsies and treatment in which the side effects are impotence and incontinence. Repeated biopsies may spread cancer cells into the track formed by the needle, or by spilling cancerous cells directly into the bloodstream or lympathic system. Perhaps one of the biggest health myths propagated in western culture and certainly in the United States, is the misuse of an invented term "bad cholesterol" by the media and medical community. Many researchers are now concluding that the answer to that question is "NO." Current data is now suggesting that lower cholesterol levels predate the development of cancer. Scientific papers prove that people with high so-called "Bad" LDL cholesterol live the longest. But is this apparent 'blanket need' to strive towards lowering our cholesterol justified? And, indeed, is it healthy? The cholesterol itself, whether being transported by LDL or HDL, is exactly the same. Cholesterol is simply a necessary ingredient that is required to be regularly delivered around the body for the efficient healthy development, maintenance and functioning of our cells. The difference is in the 'transporters' (the lipoproteins HDL and LDL) and both types are essential for the human body's delivery logistics to work effectively. Sunscreen is full of some of the most toxic chemicals known. Yet both the cancer and sunscreen industries insist on their use to ironically prevent cancer from "bad" sunlight. People still fall for this nonsense, slather on the sunscreen in hopes to protect against a non-existent foe. If the sun was really that harmful, we'd all be dead long ago. Meanwhile, a growing body of evidence shows that blocking the sun's rays from reaching our skin dramatically influences our optimal vitamin D levels, leading to higher mortality, critical illness, mental health disorders and ironically, cancer itself. Here's why you need to make your own sunscreen. There are well over 800 references in the medical literature showing vitamin D's effectiveness - both for the prevention and treatment of cancer. Blocking the sun's rays from reaching our skin dramatically influences our optimal vitamin D levels, leading to higher mortality, critical illness and mental health disorders. Ironically, sunscreen itself causes cancer. The idea that sunscreen prevents cancer is also a myth promoted by pharmaceutical companies, conventional medicine and the mainstream media for one purpose...profit. The sunscreen industry makes money by selling lotion products that actually contain cancer-causing chemicals. It then donates a portion of that money to the cancer industry through non-profit groups like Cancer Societies which, in turn, run heart-breaking public service ads urging people to use sunscreen to "prevent cancer." The term "immunization", often substituted for vaccination, is false and should be legally challenged. Medical research has well established that the direct injection of foreign proteins and other toxic material (particularly known immune-sensitizing poisons such as mercury) makes the recipient more, not less, easily affected by what he/she encounters in the future. This means they do the opposite of immunize, commonly even preventing immunity from developing after natural exposure. There are 5 phases of awakening to the dangers of vaccination and many lie in different phases. The main advances in combating disease over the last 200 years have been better food and clean drinking water...not vaccines. Improved sanitation, less overcrowded and better living conditions also contribute. This is also borne out in published peer reviewed research which prove that vaccine did not save us. There is irrefutable evidence which shows that the historical application of vaccines had no health benefit or impact on prevention of infectious disease. It is no coincidence that the more educated you are, the less chance you will vaccinate which contradicts the misconceptions of many health professionals who profess that parents don't vaccinate because they are under-educated, poor or misinformed. 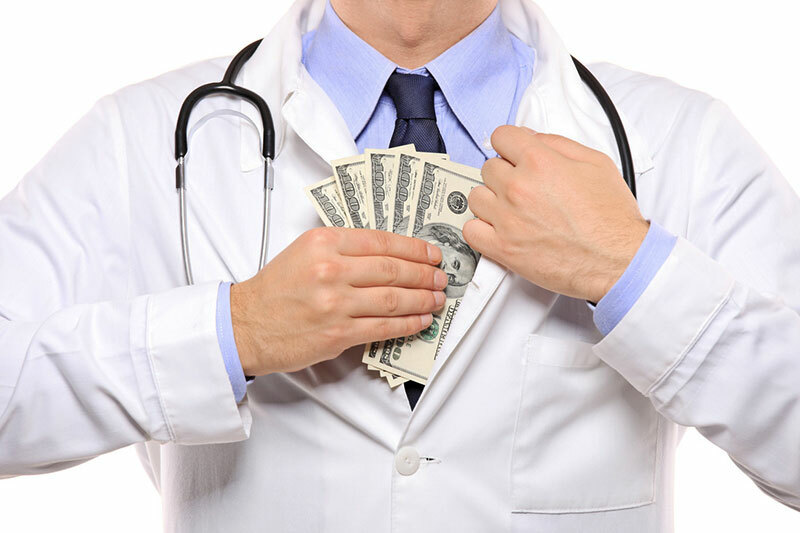 There is no financial incentive for anyone in today's system of medicine (drug companies, hospitals, doctors, etc.) to actually make patients well. The main error of the biomedical approach is the confusion between disease processes and disease origins. Instead of asking why an illness occurs, and trying to remove the conditions that lead to it, medical researchers try to understand the biological mechanisms through which the disease operates, so that they can interfere with them. These mechanisms, rather than the true origins, are seen as the causes of disease in current medical thinking and this confusion lies at the very centre of the conceptual problems of contemporary medicine. 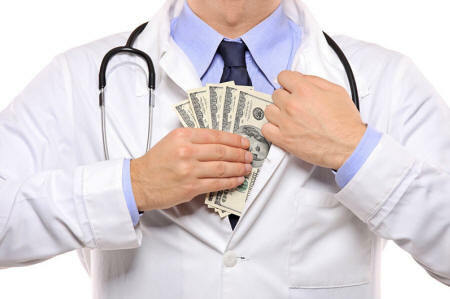 Almost all the "prevention" programs you see today (such as free mammograms or other screening programs) are nothing more than patient recruitment schemes designed to increase revenue and sickness. They use free screenings to scare people into agreeing to unnecessary treatments that only lead to further disease. The levels are "acceptable" by industry and regulatory standards, but our exposure to other "acceptable levels" of toxic chemicals that then interact with each other and dance with our cells within our bodies is never taken into consideration. We have over 200 synthetic chemicals in our bodies right now. Our exposure to toxins is that pervasive. how are they affecting us? This is all ignored by all industries. Chemicals account for an annual $3.7 trillion in sales across the globe - the United States makes up almost 19 percent. Many jobs rely on this industry, yet 85 percent of the chemicals in commerce today have not been tested. How are the products containing those chemicals impacting our health? What’s the impact on those who work or live near the chemical plants? Is it really that hard for most people to believe that we are being assaulted on a daily basis by chemical terrorism? Genetically modified foods, artificial flavors, colors, preservatives, emulsifiers, and sweeteners all made with toxic chemicals, all of which are proven toxic to human health. Artificial sweeteners, preservatives, nitrates, artificial colors, MSG... if it’s processed, chances are it contains one or more of these ingredients. Sodium benzoate and potassium benzoate are preservatives that are sometimes added to sodas to prevent mold growth, but benzene is a known carcinogen. Butylated Hydroxynaisole (BHA) is another preservative that’s potentially cancer-causing. Reading labels is an easy solution - if you don’t recognize an ingredient, don’t buy the food product. There are no acceptable levels of any chemicals that belong in our foods and it's time we get the chemical industry out of our foods. Many combinations of natural products are as effective as man-made drugs, but without the side effects when acting against specific diseases. For empirical evidence, look no further than the indigenous tribes and cultures which still use many formulations pre-dating the historical record and with great success. A comprehensive study and first of its kind published in PLoS One assessed 124 natural product combinations and found that in the right combinations, they can match drug level potency. Plants are better than drugs on many levels. Specific herbs, fruits and vegetables have been found on many instances to work better than medication for specific diseases. For example, Soursop Fruit has been found to kill cancer up to 10,000 times more effectively than strong chemotherapy. Consuming apples daily has been found in some studies to be more effective than statin medications at reducing heart disease. Cranberry juice, garlic and turmeric are just three of dozens of other foods which beat drugs in treating and preventing disease. Despite the medical model which relies on pharmaceutical intervention for every known illness, there are well over one hundred common diseases that can be reversed naturally. That's the difference between treatment for profit and healing for wellness. Doctors and pharmaceutical companies make money from it. That's the only reason chemotherapy is still used. Not because it's effective, decreases morbidity, mortality or diminishes any specific cancer rates. In fact, it does the opposite. Chemotherapy boosts cancer growth and long-term mortality rates. Most chemotherapy patients either die or are plagued with illness within 10-15 years after treatment. It destroys their immune system, increases neuro-cognitive decline, disrupts endocrine functioning and causes organ and metabolic toxicities. Patients basically live in a permanent state of disease until their death. The cancer industry marginalizes safe and effective cures while promoting their patented, expensive, and toxic remedies whose risks far exceed any benefit. This is what they do best, and they do it because it makes money, plain and simple. No such study has ever been conducted by independent investigators in the history of chemotherapy. The pursuit of truth in modern scientific query is marred by greed and profit, and only a concept of truth built on the assumption of an unexamined good. While pharmaceutical drug approvals, genetically modified foods and various other controversial technologies may appear to be based on "science", corporate interests and profits often interfere with the true meaning of what science represents to both academics and the public. The primary methodology of science is to prize apart reality into its component parts in order to better understand how the whole functions. Cartesian logic began with the separation of mind and matter and the scientific method depends upon the separation of the observer from the observed. 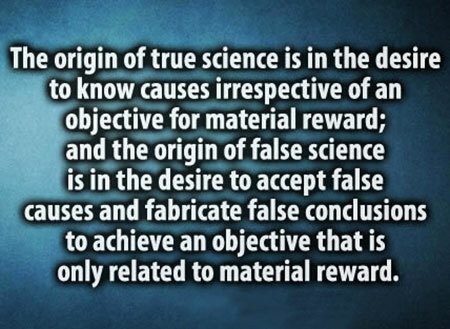 The absolute separation between mind and matter has now been shown to be entirely fictitious the importance of objectivity within the scientific method remains undiminished. 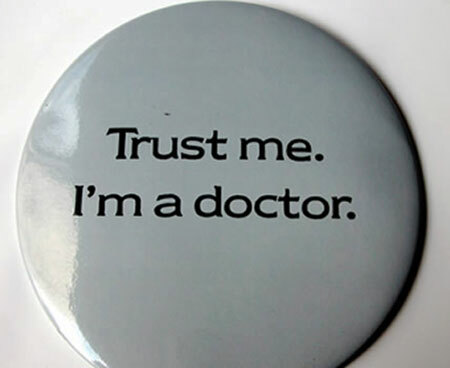 There is little real science to be found in the common practice of mainstream medicine. Rather, what passes for "science" today is a collection of myths, half-truths, dishonest data, fraudulent reporting and inappropriate correlations passed off as causation. Correlational studies can NOT prove causation, yet the end result of most scientific studies in mainstream medicine make a causal claim without any proof and then pass those suggestions to the public to sell the medical model to the public. Advertisers and product manufacturers have certainly used this inherent cognitive bias towards trusting "scientific facts" in order to market products which they claim have a scientific basis in their effectiveness. The same is of course true within ideologies and politics. While many choose to focus on the large scandals such as the drug research fraud, countless fraudulent scientific claims are made every day in advertising, often with no repercussions. Ask any scientist in the field of health and safety and they will tell you that toxicity is all about the dose. While you can die from anything taken in excess, even water, you can also run into serious fatal complications from any poison at any dose if you take it long enough. There is no safe dose of a poison because the body recognizes even the smallest dose and immediately creates inflammatory cascades and immune responses to combat these foreign entities. Toxic chemicals are now invading every facet of our lives from our schools to our workplaces. They are gradually deteriorating every single system in our bodies and causing so many diseases, that it's now difficult to isolate exactly which chemicals are causing each disease. The chemical testing we currently do to establish if a chemical is safe may not be sufficient. In particular, we may not be targeting nor understanding the effects of extremely low levels of chemical contaminants during critical phases when the organism is "listening" for chemical messengers. This occurs, for example, during fetal development and during changes that occur in puberty. does this chemical mimic any of the messenger chemicals that organisms depend upon for survival? What most of these chemical management companies, their regulatory agencies and scientists do not appreciate, is what a delicately balanced organism we are especially at the molecular level. At this level, chemicals act more like a handshake than like that third pint of beer. Life expectancy at birth rose by a few years for both men and women in the last two decades of the 20th century. This has come at an enormous cost in the quality of life of our elders, for they are suffering with more pain and greater disability than ever before in last 15 years of life. People globally are living longer but chronic debilitating conditions are becoming more prevalent. Perhaps most worrisome is the medicalization of childhood which is leading us to illness if adulthood. Cannabis does this so well, that few drugs can compete with its level of potency which come essentially with no side effects. Consquently cannabis is labeled a threat to mainstream medicine. The question is no longer which disease cannabis can cure, but which disease can't it cure? A study published in Nature Reviews-Cancer provides an historic and detailed explanation about how THC and natural cannabinoids counteract cancer, but preserve normal cells. It's no surprise that the United States has decreed that marijuana has no accepted medical use use and should remain classified as a highly dangerous drug like heroin. Accepting and promoting the powerful health benefits of marijuana would instantly cut huge profits geared towards cancer treatment and the U.S. would have to admit it imprisons the population for no cause. Nearly half of all drug arrests in the United States are for marijuana. "...there really is massive proof that the suppression of medical cannabis represents the greatest failure of the institutions of a free society, medicine, journalism, science, and our fundamental values," Cowan notes. Many researchers have noted that there was "inadequate" data for decades to determine whether smoked marijuana was safe or effective in treating symptoms of pain and preventing disease. This view was supported by Dr. David Bearman, the executive vice president for the Academy of Cannabinoid Medicine/Society of Cannabis Clinicians. "Part of the problem in the United States is that the NIDA has blocked almost all meaningful studies on cannabis," Bearman said. Bearman argues that while synthetic cannabis pills do offer pain relief, marijuana is cheaper, has fewer side effects and can be more effective.